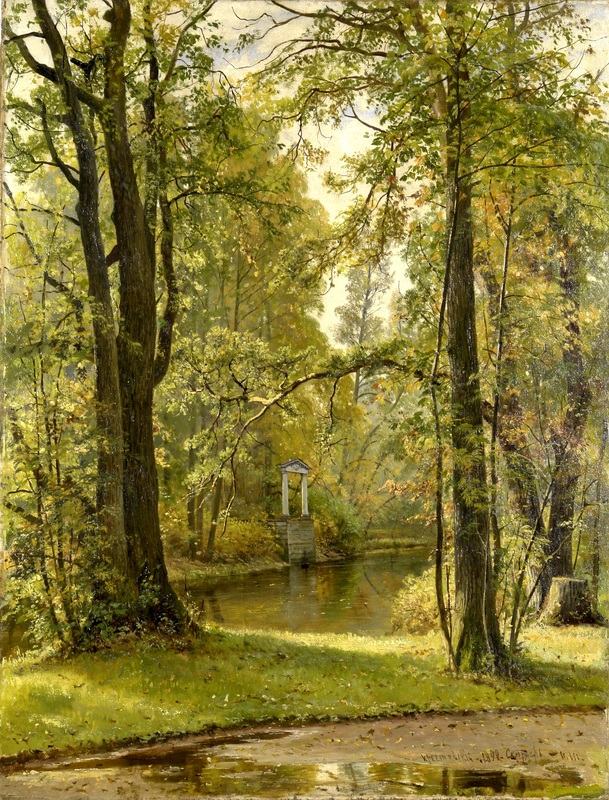 Peder Mørk Mønsted – private collection. Title: Waldlandschaft. Date: 1912. Materials: oil on canvas. Dimensions: 49.5 x 82 cm. 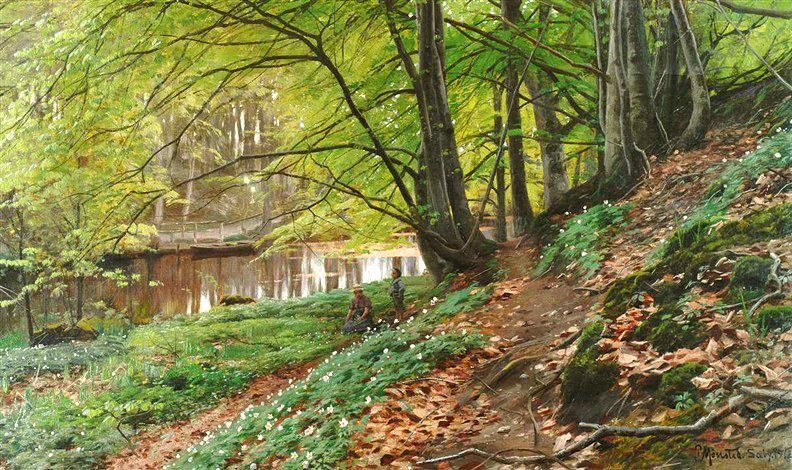 Source: https://www.facebook.com/pedermorkmonsted/photos/a.621116911333928.1073741830.621105614668391/1455558057889805/?type=3&theater. I have changed the light and contrast of the original photo. Ivan Skishkin – private collection. Title: Autumn on Krestovsky Island. Date: 1892. Materials: oil on canvas. Dimensions: 110 x 84.5 cm. Source: https://www.flickr.com/photos/russianartandculture/17041654609/sizes/o/. I have changed the light and contrast of the original photo. 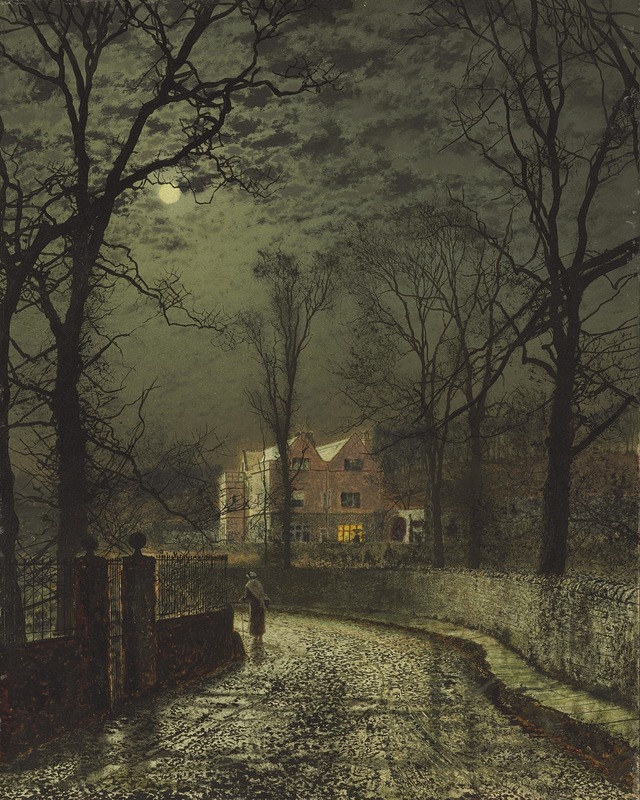 John Atkinson Grimshaw – private collection. Title: Snow at Daichi. 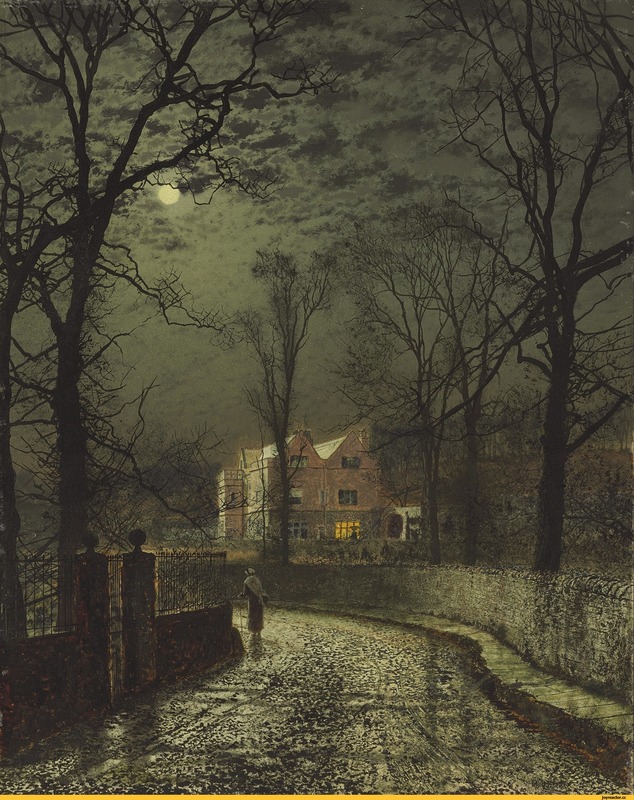 Date: 1880s – early 1890s. Materials: oil on board. Dimensions: 55.2 x 43.8 cm. Sold by Christie’s in New York, on June 4, 2009. Source: http://img1.joyreactor.cc/pics/post/full/Metal-%D1%80%D0%B0%D0%B7%D0%BD%D0%BE%D0%B5-%D0%BC%D1%83%D0%B7%D1%8B%D0%BA%D0%B0-Heavy-Metal-1604851.jpeg. 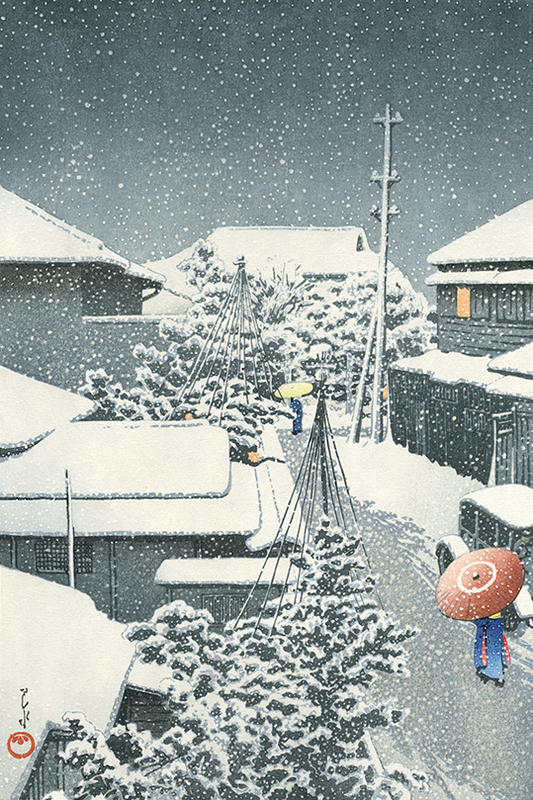 Hasui Kawase – Floating World Gallery. Title: Snow at Daichi. Date: 1925. Materials: woodblock print. Dimensions: 33.4 x 22.5 cm. Posthumous edition, printed in the Heisei Period (beginning 1989), by Shobisha, from the original blocks. This design was originally published by Isetatsu; Shobisha acquired the blocks in the 1950s. Source: https://floatingworld.com/product/snow-at-daichi/. Hubert Robert – The Art Institute of Chicago 1900.382. 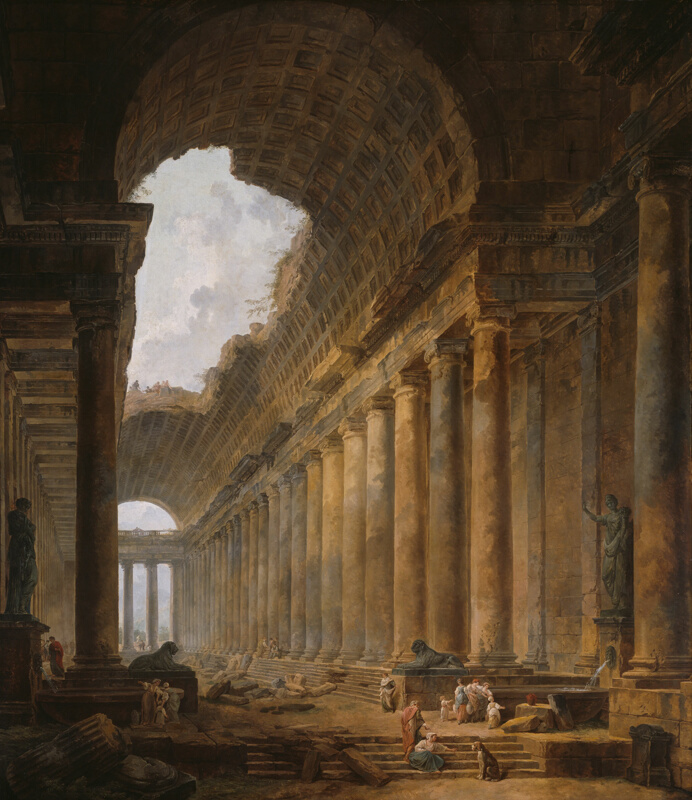 Title: The Old Temple. Date: 1787/1788. Materials: oil on canvas. Dimensions: 255 x 223.2 cm. Nr. : 1900.382 Source: https://lakeimagesweb.artic.edu/iiif/2/6308396a-35eb-07d6-ba30-ff52690f862e/full/!800,800/0/default.jpg. I have changed the light and contrast of the original photo. 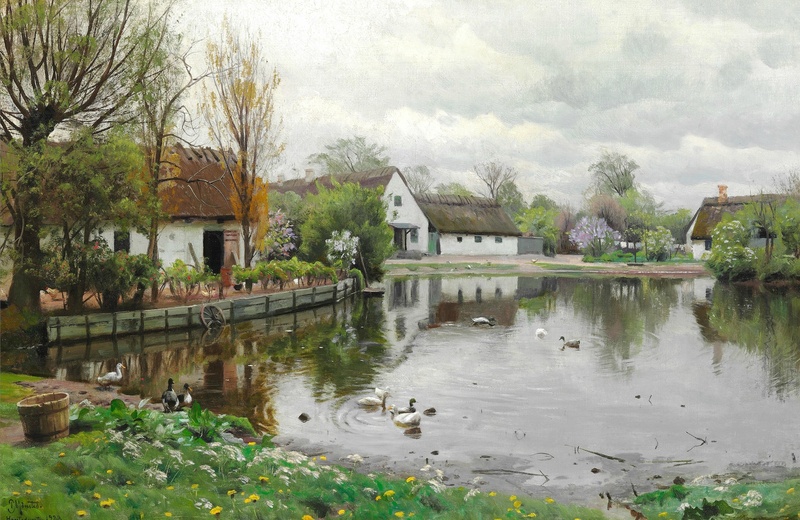 Peder Mørk Mønsted – private collection. 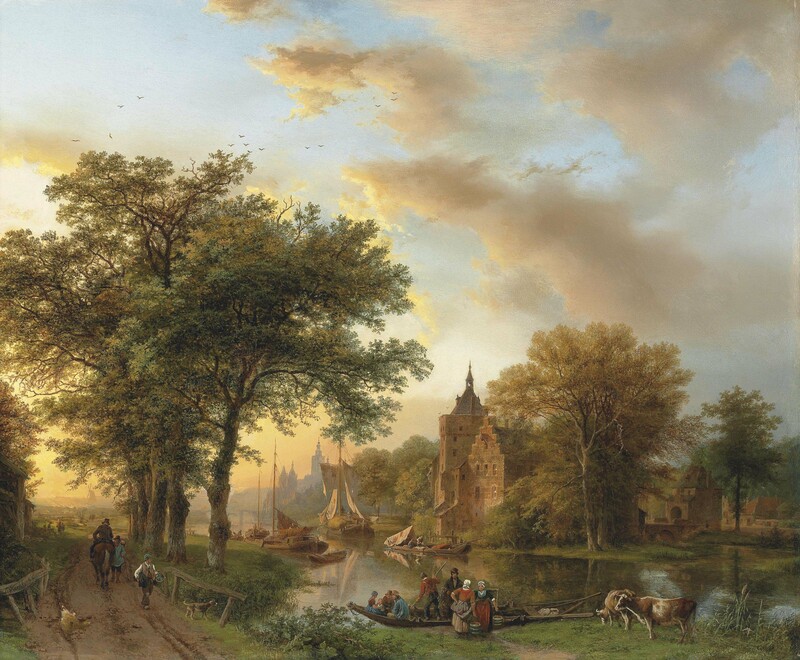 Title: The Village Pond in Herstedvester. Date: 1923. Materials: oil on canvas. Dimensions: 59 x 90 cm. Source: https://3.bp.blogspot.com/-PMvrna_HNng/WKzPr0W37WI/AAAAAAABG7s/AOvlqfMR-2sShmRJtMKfaeNMIu7tqHPdQCLcB/s1600/1923_%25D0%2594%25D0%25B5%25D1%2580%25D0%25B5%25D0%25B2%25D0%25B5%25D0%25BD%25D1%2581%25D0%25BA%25D0%25B8%25D0%25B9%2B%25D0%25BF%25D1%2580%25D1%2583%25D0%25B4%2B%25D0%25B2%2B%25D0%25A5%25D0%25B5%25D1%2580%25D1%2581%25D1%2582%25D0%25B5%25D0%25B4%25D0%25B2%25D0%25B5%25D1%2581%25D1%2582%25D0%25B5%25D1%2580%25D0%25B5%2B%2528The%2Bvillage%2Bpond%2Bin%2BHerstedvester%2529_59%2B%25D1%2585%2B90_%25D1%2585.%252C%25D0%25BC._%25D0%25A7%25D0%25B0%25D1%2581%25D1%2582%25D0%25BD%25D0%25BE%25D0%25B5%2B%25D1%2581%25D0%25BE%25D0%25B1%25D1%2580%25D0%25B0%25D0%25BD%25D0%25B8%25D0%25B5.jpg. Claude-Joseph Vernet – The Bowes Museum B.M.280. Title: Nymphs Bathing: the Time is the Morning. 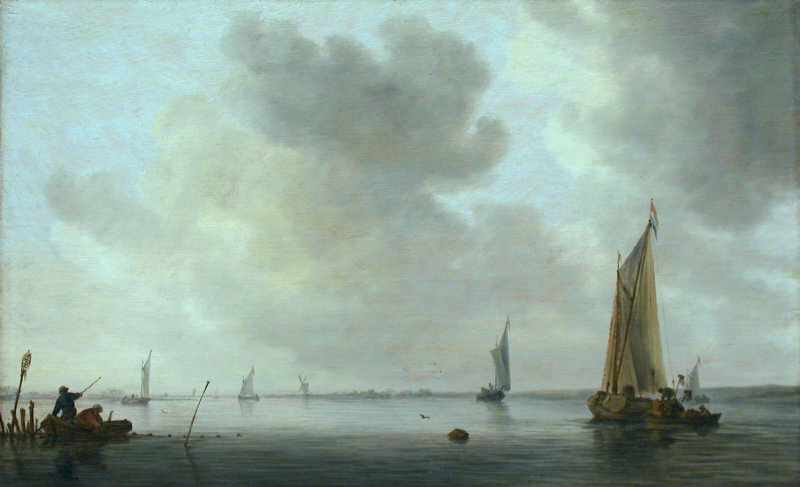 Date: c. 1770-1772. Materials: oil on canvas. Dimensions: 65.1 x 98.8 cm. Nr. : B.M.280. 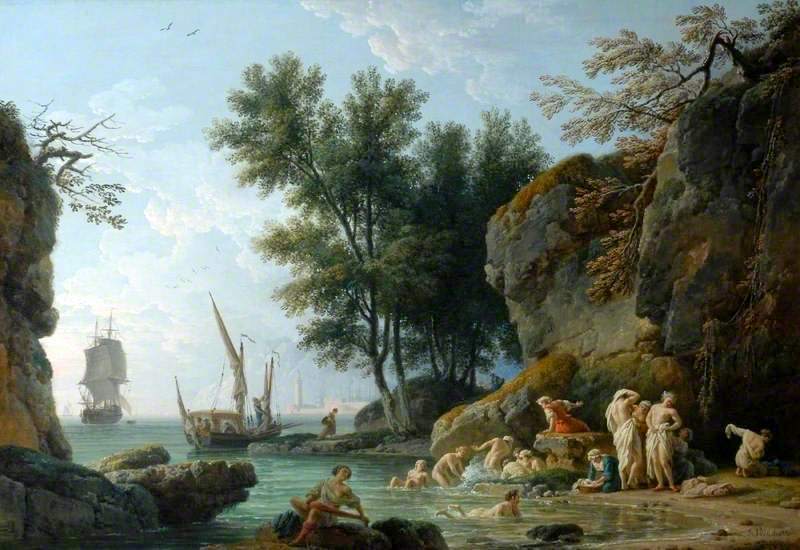 Source: https://artuk.org/discover/artworks/nymphs-bathing-the-time-is-the-morning-44289/search/actor:vernet-claude-joseph-17141789/page/1/view_as/grid. I have changed the light and contrast of the original photo. 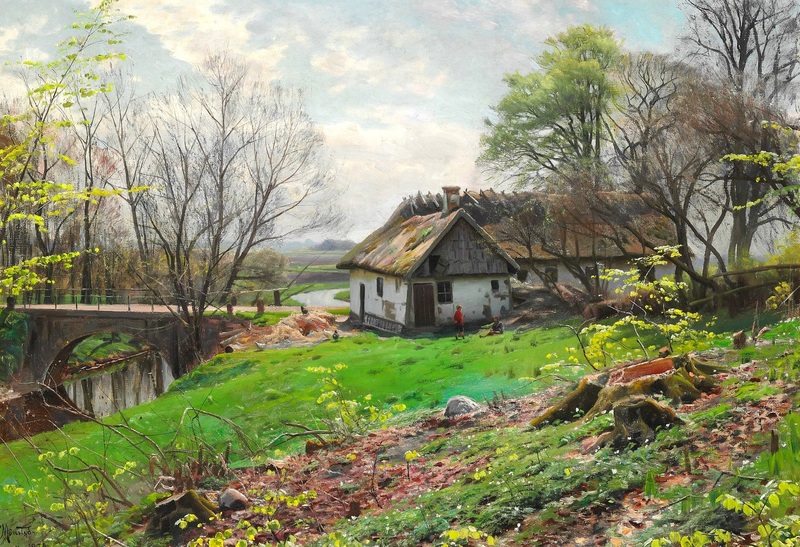 Peder Mørk Mønsted – private collection. Title: Summer Day with Children Playing behind a Thatched Farm. Date: 1924. Materials: oil on canvas. Dimensions: 70 x 100 cm.. Inscriptions: P. Mønsted Bromølle 1924. Source: https://s017.radikal.ru/i408/1604/d2/9e960e6c62f2.jpg. I have changed the light and contrast of the original photo.